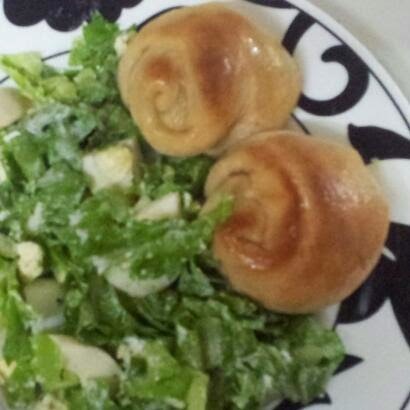 For these tasty and healthy rolls credit goes to my lovely sis Neha . She is having some wonderful recipes and some great art ideas on her site colourandsome....http://coloursandsome.blogspot.com/. Activate yeast in warm water . Mix all dry ingredients and water and make dough . Let the dough be sticky . Let it sit for 45-60 minutes . After which Divide them into 10 portions of small size . Dust the surface and roll them into long oval shaped disc about size if your palm. Apply butter on surface and fold it into half , then again apply butter on upper side all over . Now start rolling them from one side till the end . Repeat for all 10 portions . Keep them for another 30 minutes in the mean time pre heat oven at 180 degrees. Bake them in oven for 20 minutes . I usually broil in the end for 2 minutes to give nice golden brown colour on top of rolls . Your dedication to cooking is inspirational!